Overcoming Movement Disorder: A recovery weekend. One of the countless times Bertrand's nose bled this weekend. Bertrand was extremely groggy, nauseated and sore for the past few days. 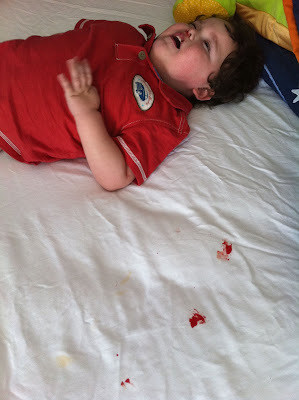 He vomited a few times on Thursday, but harder to witness were his repeated nose bleeds on the following days. (These could've been caused or aggravated by the EGD.) I've lost track of the number of times I have changed/washed his sheets. A combination of humidifiers, motrin, ayr saline gel, books, Elmo and snuggles helped keep my poor baby comfy. Thankfully, this evening Bertrand finally seemed back to normal.